It was a glorious summer day. I walked outside and felt the sun on my face. Birds were singing and some were quite loud. Glancing over at the grill made me smile thinking about the meal to come. A few prep tasks had to be finished and a bottle of wine opened. One must sip on a cold glass of wine while grilling in the heat . Back to the kitchen I went to pull out the remaining ingredients for Asian Pork Lettuce Cups. Grillers have their own rituals. They vary and yet can be so similar. BBQ enthusiasts look forward to the entire process. Some are intense on making sure each step goes flawlessly. Mine always involve wine. I either use it in the recipe, sip on it while grilling, or both. Most of the time opening the wine is step one. Then I uncover the grill, scrape the grates, turn the knobs, and listen for the click, click, click, whoosh sound of flames igniting on the burners. Asian Pork Lettuce Cups is my latest grilling adventure. It came to pass after the wonderful folks at Gallo sent bottles of their Sweet White Blend and Merlot for inspiration. It took about two seconds to know something Asian would be in the works. The dish had to be light, yet satisfying, and great for summer. There are so many tasty elements in these lettuce cups. Sweet white wine balances tartness of lime juice. Peaches are one of the flavors of GFV’s Sweet White Blend so adding grilled ones was in order. Plus those sweet peaches contrast hot jalapeño peppers. Salty soy sauce is mellowed with honey. Fresh ginger and garlic’s earthiness is brightened with cilantro. Cabbage and radish add crunch under tender pork. It’s all piled on top of crisp Boston lettuce leaves. Are you hungry yet? It’s time to fire up the grill. 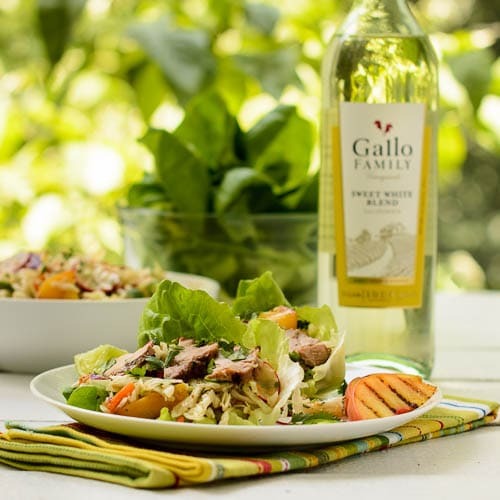 Sunday Supper is proud to partner with Gallo Family Vineyards sharing grilling recipes and BBQ wine pairings. Head to the store and get GFV’s Sweet White Blend or Merlot when preparing for your grilling occasions. There is a $1 off coupon or rebate available (depending on your area). Scroll down to find a list and links to recipes from Sunday Supper contributors and check out Gallo’s grilling recipes too. Oh, and on the subject of peaches, did you see my Peach Sorbet? More on Gallo Family Vineyards: You can follow them on Facebook, Twitter, Instagram, and YouTube. Their website has information on all Gallo Family wines and a store locator. 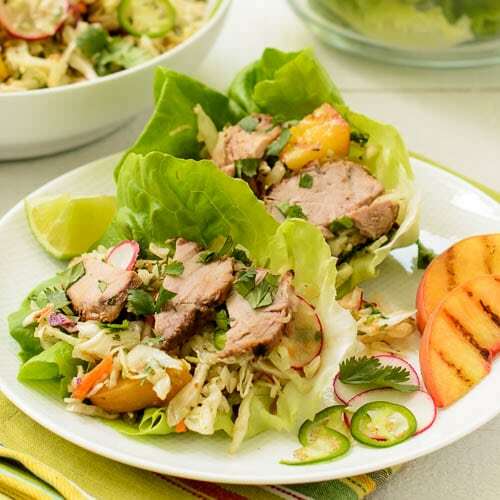 Asian Pork Lettuce Cups is a great food for on the go and if on a diet. Finely chop 1/4 cup cilantro and place in a small bowl. Add lime zest, juice, wine, honey, ginger, garlic, green onion, and 1 tablespoon oil. Whisk to combine. Transfer 1/4 cup dressing to a large plastic zip top bag. Cover remaining dressing and chill. Trim off and discard any fat or silver skin from the pork. Tie the pork tenderloin for even cooking. Add pork to the bag and seal, pressing out as much air as possible. Marinate pork in the refrigerator at least 2 hours or overnight. Remove pork from the refrigerator and allow it to get to room temperature, about 1 to 1 1/2 hours. Heat grill to medium-high. Remove pork from the marinade and grill, covered, until the internal temperature is 145 degrees F, about 18 to 20 minutes. Turn pork a few times while grilling for even cooking. Discard marinade. Transfer pork to a cutting board, loosely cover with foil, and let rest for 10 minutes before slicing. Cut peach into 10 or 12 wedges. Discard the pit. Brush peach slices with oil. Grill slices until slightly charred, about 1 to 2 minutes per side. Cut peach slices into halves or thirds (to make them bite-sized). Thinly slice pork and transfer to a serving plate. Whisk 2 tablespoons oil into the dressing. Combine coleslaw mix, radish slices, jalapeño slices, and remaining cilantro (chopped) in a large bowl. Pour dressing over slaw and toss to coat. Gently stir in peaches. 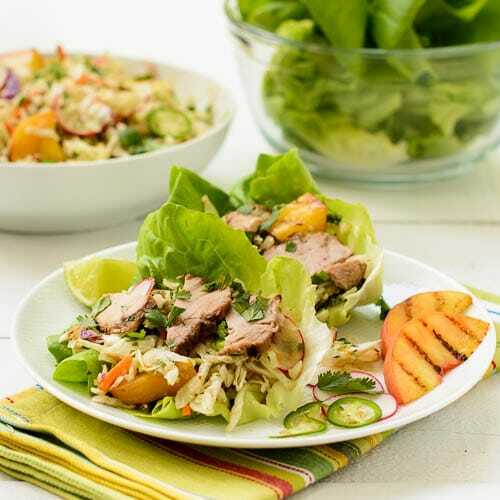 Serve slaw with sliced pork and lettuce leaves. A recipe for Crispy Fish Sticks with Roasted Potatoes, a lighter version of classic fish and chips. It is baked and served with a spicy tartar sauce. Love all the contrasts you brought out in this dish! Looks amazing! This is a great pairing with the Sweet White Blend. Pinning! Thanks Shannon and I appreciate the pin. What a great way to serve grilled pork. I love that you used the marinade for a dressing too! Have a dual marinade/dressing is so nice. It makes it easy and makes sure you have the same flavors throughout. 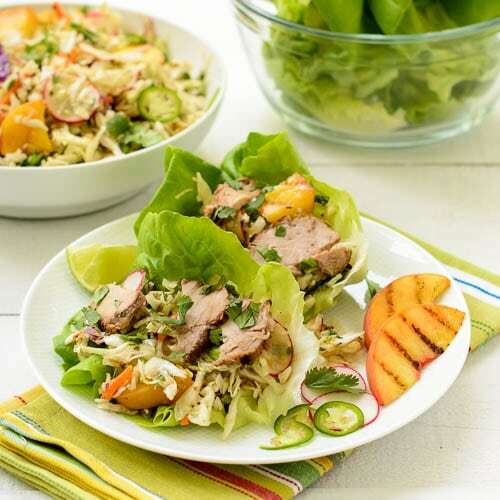 Your lettuce wraps look AMAZING, Renee! I love how you used slices of pork instead of ground pork. And grilled peaches? Sublime. I like the sliced pork for the cups too. And yea, grilled peaches are the bomb. Lettuce cups are such a great way to serve up a light meal in the summer. Looks great! Renee, now, this is my kind of meal! LOVE these Asian pork lettuce cups!!! and that marinade and dressing sound fabulous! I’m quite sure I’ll be using the marinade/dressing for more things too. These look so light and beautiful – loving the pairing with the wine as well! Your photos are absolutely stunning. I want to sit at that table and chow down on those lettuce cups. Gorgeous! Thank you so much Jennie and I really appreciate the compliment on my photos. I was just looking for a good pork/lettuce cup recipe! LOVING the flavor this must have Renee. Can’t wait to try it. Thanks Tammi and I hope you enjoy them. Yep, that’s dinner for me! I figured this would be something you would really like Dorothy. Ohhhhhhh, how light and refreshing! What a great recipe! I would so eat this for dinner! Yum! I love everything about these. Those caramelized grill marks are just so inviting! Plus, eating lettuce cups/wraps always makes me feel virtuous (no matter what’s inside). 😉 YUM! I love those grill marks too. Now that you mention it, I think I feel a bit virtuous when I eat lettuce cups too. 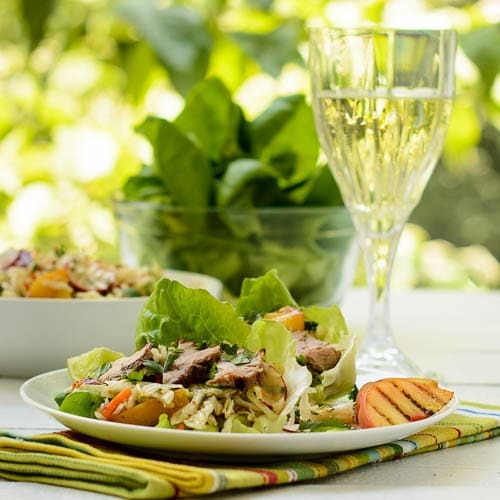 Grilled peaches, grilled pork and lots of tasty goodness all with my favorite Sweet White Wine! I can’t wait to try these!! This looks like a perfect light, refreshing Summer dinner! Love this and can’t wait to give it at try! It sure is a great summer dinner. Thanks Wendy. I absolutely love the flavors in this dressing/marinade! These look fabulous! I can picture myself enjoying these on a summer evening very soon! So many great flavor combos going on here! Yum! I love these Renee! AS soon as I saw them I knew I wanted to make them, and I just had a person from my Goggle+ say she had purchased some fresh peaches so she was going to make your dish!! Thanks Bobbi and how great someone already wants to make this dish. I appreciate the share.